Includes 12 4" x 6" Magnetic Picture Frames. Great way to display photos of your loved ones on the fridge at home or metal cabinet at work or school. 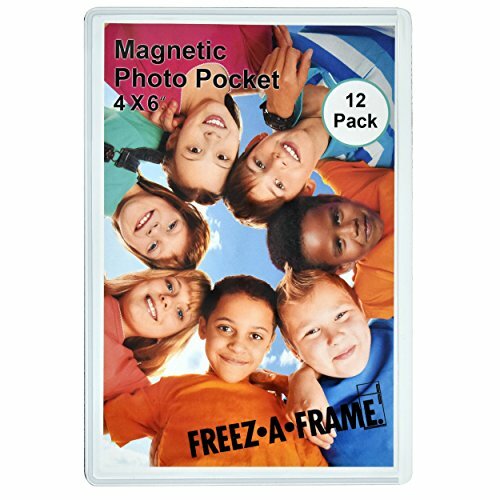 Flexible magnetic backing securely holds photo pocket frame to refrigerator or any metal surface. Snug fit ensure pictures hold either vertical or horizontal. High Quality: The magnetic photo frame holds the picture in tight from the side so it doesn't fall out. These picture frames are proudly made in the USA. Slam Proof Magnet: The magnetic photo pocket stays firmly on the fridge or metal cabinet with the strong 'Slam Proof' magnet on the full back. If you have any questions about this product by Freeze A Frame, contact us by completing and submitting the form below. If you are looking for a specif part number, please include it with your message.